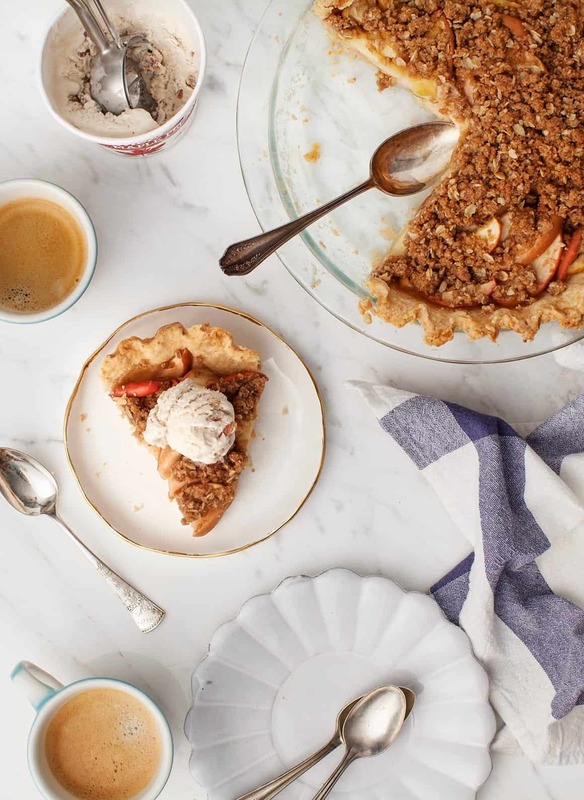 This vegan apple pie with a homemade coconut oil crust and cinnamon-ey crumble topping is so delicious for fall and Thanksgiving. Hi all, this is Jeanine’s husband Jack and, well, it’s fall. We all know what that means… pie! Lots of it. Pie was a fixture for my holiday meals growing up. My mom made it, my sister made it, I’m pretty sure most of the family made it. There was always more than enough pie to go around. Of course, there was one person who never, ever made pie. Me. It turns out that Jeanine had a similar story – all of the pie she ate was made or brought by other people. This felt like a perfect project for our partnership with Wolf and their Reclaim the Kitchen initiative. 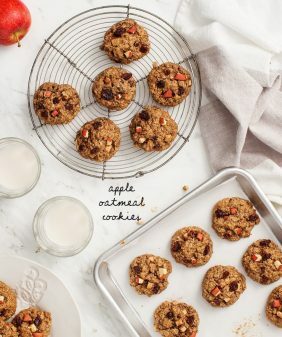 The goal of Reclaim the Kitchen is to inspire people through practical meal ideas and tips to get in the kitchen and spend quality time with loved ones by preparing and enjoying food together. What’s fun about this recipe is that we split the pie responsibility in half – I did the crust, she did the filling, and it’s great to see both of our hard work come together to make homemade pie from scratch. While pumpkin pie might be more popular at this time of year, Jeanine has a soft spot for soft apples, so our filling choice was quickly decided. As for the crust, we tried a few different versions. We found that we preferred the flakiness of a crust made with coconut oil over butter. Also, to make it a bit more wholesome we opted for half whole-wheat pastry flour and half all-purpose flour. So we somehow stumbled into making a vegan apple pie. I have to admit – I was a bit intimidated by the crust. People talk about a lot of things that can ruin a pie crust, and reading pie crust recipes makes it sound like a really stressful experience. Well, it doesn’t have to be. At the end of the day, pie dough is just dough. If (when) there’s a hole or a thin spot, just tear off dough from somewhere else on the pie and patch it up. If (when) you set it in the pie plate and it’s not perfectly centered, just slide it. If (when) there’s a crack, just push the dough together. Thinking about it like this took much of the stress away. While I was testing out my first pie crust (yes, I baked a pie crust with no pie), Jeanine worked on her filling. She kept it super simple and sliced up a bunch of apples (feel free to peel them if you like), tossed them with lemon juice, vanilla, and just a bit of maple syrup. Instead of a top crust, she made an oat crumble with lots of cinnamon and nutmeg. So here you have it – our first homemade blog pie. Thanksgiving here we come! For the crust: In a medium bowl, whisk together the flours, sugar, and salt. Transfer half of the flour mixture to a food processor and scoop in the coconut oil by large separate tablespoonfuls, about 8. Pulse until the mixture starts to crumble, 12 to 16 pulses, then add the remaining flour and pulse until the mixture resembles coarse sand, about 8 more pulses. Transfer the crumbly dough back to the original bowl. 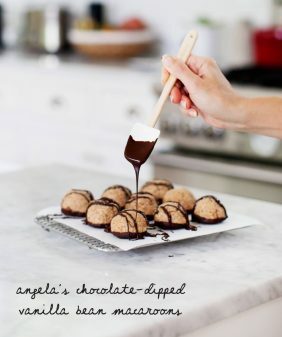 Sprinkle in the ice water, 1 tablespoon at a time, and use a rubber spatula to fold and form the dough until it sticks together in a cohesive ball. Knead the dough a few times to get it to come together in a smooth ball, but be careful not to overwork it. Form the dough into a 1½-inch thick disk, wrap it in plastic wrap, and chill for 30 minutes. Place the chilled dough onto a lightly-floured surface, or floured parchment paper. Roll the dough into a 7-inch circle, then flip and dust your surface with a bit more flour before placing it back down. Continue to roll into a 12-inch circle. If the dough is too firm, let it sit for 10 minutes at room temperature. If it’s too sticky, add more flour. If the dough cracks, patch it and continue rolling. Gently transfer the dough to a 9-inch pie plate. Trim the overhanging to about ½ inch, then tuck it under and crimp the edges with your fingers. Lightly cover the pie crust and chill for 30 minutes while you make the crumble topping and filling. For the crumble topping: In a food processor, pulse together the flour, oats, brown sugar, salt, cinnamon, and spice until combined. Add the coconut oil and pulse until crumbly. 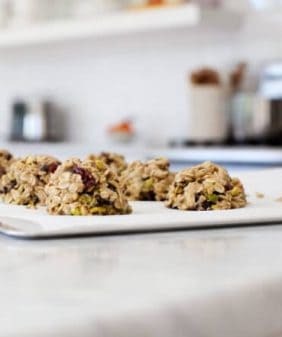 If it's too dry, add cold water 1 tablespoon at a time until larger crumbles form. Set aside. For the filling: Preheat the oven to 375°F. Fill the pie crust with the apple mixture and sprinkle evenly with the crumble topping. Bake for 30 minutes and then lightly cover with foil and rotate the pan in the oven. Bake 15 to 20 more minutes or until the apples are tender and the crust is golden brown. Cool 1 hour at room temperature before serving. 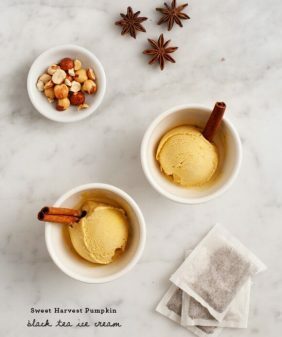 Serve with scoops of vanilla ice cream. *If your coconut oil is melted, pop it in the fridge and wait for it to firm up (usually 10 to 15 minutes). 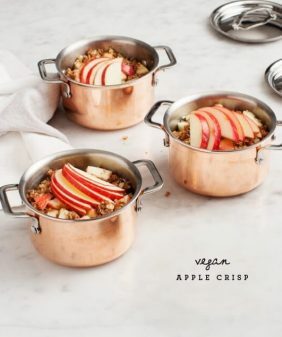 Crust recipe is adapted from Vegan for Everybody by America's Test Kitchen. Special thanks to Wolf for partnering on this post! 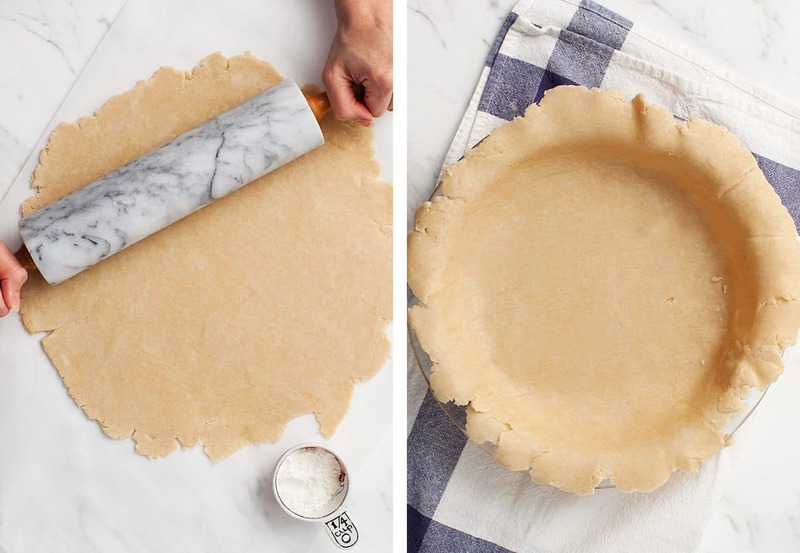 Not sure if you’ve heard of these tricks, but you can use a pie crust bag (available anywhere) for rolling out even pie crust – a game-changer! Also, if you choose to use butter instead of coconut oil, you can freeze a stick, then use a cheese grater to cut in the butter for no clumps and no worries – that was a trick from our grandma a long time ago. Okay, enough of that – your pie looks amazing! …and extra credit to Jeanine for a great and different topping idea! This pie is just stunning! I love that crumble topping! I think this is the perfect pie, seriously that crust is awesome! Yum jeanine this looks deliriously good! How good is apple crumble? wait let me answer that. so good. can one ever tire of old classics like that? me thinks no. This looks fab, would so love to pop over and have a slice with you guys right now. Hope you’re enjoying your new house, and looking forward to the holidays! This recipe is simply stunning ♥ No one believed it’s vegan! Looks like you nailed it! Woo hoo! And I’m with Jeanine – I’m partial to apples, too! Does using coconut oil make it taste like coconut? If you use refined coconut oil then it’s very very slight. (there are usually 2 options in every store: refined and unrefined). Unrefined has a more distinct coconut flavor. OMG, this looks unreal! It will definitely be a crowd pleaser! This pie looks wonderful! Finally I find a crust with coconut oil and no nasty hidrogenated shortening (there’s non-hidrogenated, but still hate it). GORGEOUS. 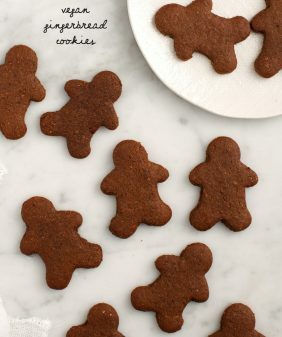 Perfect for the holiday and love that it’s vegan so everyone can enjoy!